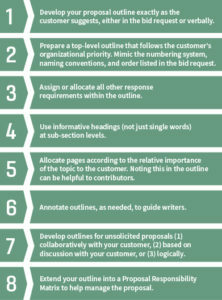 Creating a well-organized proposal outline is a crucial activity for the proposal manager. Much of the subsequent proposal development work stems from the initial outline. The outline often establishes the table of contents, serves as a proposal management tool, and helps writers and contributors see where their task fits in relation to the entire proposal. Guidelines for developing sound proposal outlines are based on the principles of customer focus and organization. By following customers’ instructions exactly, no matter how illogical, you demonstrate that you listen to your customers. Developing a compliant outline can be difficult. Nearly every bid request is confusing on the first reading. The difficulty increases with complex and poorly written bid requests (RFPs). Often, management applies pressure on proposal managers to start writing immediately. Ignoring this step in the proposal planning and development phases of business development can lead to re-work and confusion. Spend time developing a thorough and comprehensive outline to improve your probability of winning (Pwin).